Please note all Santa carvings are one of a kind. Although PayPal's shopping cart allows you to increase the quantity of an item - due to the one-of-a-kind nature of these carvings, if that option is used your order will be rejected. We attempt to keep these pages updated - if two orders are placed for the same carving, the first order in our mail box will be accepted. The second customer would have the option of modifying their order or a complete refund. Thanks for understanding! Tom created his small wooden Santa carvings for wine bottle stoppers. A Santa collector requested he make some without the cork and instead attach a small brass screw eye, making them into ornaments. Another collector of Santa folk art requested he make them without the cork or the screw eye - to just be small figurines. In an effort to satisfy everyone - these small Santa carvings have no cork or screw eye. If you'd like to make them into ornaments - simply request that option in the PayPal message to seller. There is no charge to attach the brass screw eye. If you'd like them to be turned into wine bottle stoppers - simply order the wine stopper option. Corks are attached by drilling into the base of the Santa, gluing a dowel which then extends through the cork. Our bottle stopper corks are guaranteed not to break off. This option will add a week to the turn around time. 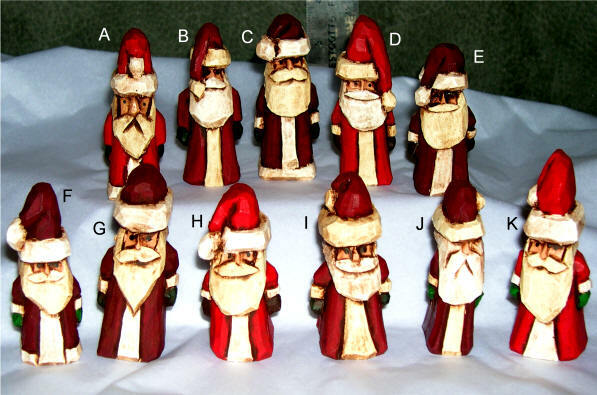 These small Santa carvings require almost as much time to carve, paint and antique as their larger counterparts. We attempt to price them as reasonably as possible but can not give quantity discounts as they are time consuming to create - but they're so cute! Small Santa A - In his Christmas Red Coat with hat flopping forward, he stands just a hair over 3" tall. Small Santa B - Burgundy classic coated Santa with very recessed face and great antiquing. About 3 1/8" tall. Small Santa C - A robust jolly Santa that is really cute! Santa stands about 3.25" tall. Small Santa D - At about 3.25" tall, this thin classic line Santa carving would make a great tree ornament! He's a bit thin for a stopper - with his base being about the size of the cork - but some people like them that way! Small Santa E - The heavy antiquing slightly hides his features but this is a great looking carved Santa! About 2.75" tall. Small Santa G - In his dark red coat with hat flopping down in back, Santa G stands 3" tall. Small Santa H - At 2.75" tall, this Bright Red Santa has a ton of detail and personality for such a little guy! Small Santa I - This little guy just makes me smile! Again, plenty of detail in this little 2 7/8" tall Santa. Small Santa J - SKINNY! - This little guy was carved from a scrap piece of basswood, Tom even celebrated the shape. He is sooooo skinny, that his hat has flopped down and all you can see is his nose! Small Santa K - Another Santa that will really make you smile! He's got a small, cork sized base and stands about 3.25" tall. He'd make a better ornament than stopper - but we can always cork him if you'd like!